King Philip's War, sometimes called the First Indian War, Metacom's War, Metacomet's War, or Metacom's Rebellion, was an armed conflict between Native American inhabitants of present-day New England and English colonists and their Native American allies in 1675–78. 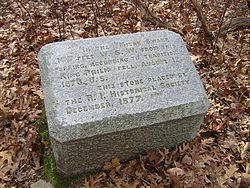 The war is named after the main leader of the Native American side, Metacomet, known to the English as "King Philip". 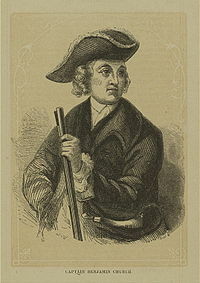 Major Benjamin Church emerged as the Puritan hero of the war; it was his company of Puritan rangers and Native American allies that finally hunted down and killed King Philip on August 12, 1676. The war continued in northern New England (primarily in Maine at the New England and Acadia border) until a treaty was signed at Casco Bay in April 1678. The war was the single greatest calamity to occur in seventeenth-century Puritan New England. In the space of little more than a year, twelve of the region's towns were destroyed and many more damaged, the colony's economy was all but ruined, and much of its population was killed, including one-tenth of all men available for military service. More than half of New England's towns were attacked by Native American warriors. Plymouth, Massachusetts, was established in 1620 with significant early help from local Native Americans, particularly Squanto and Massasoit, chief of the Wampanoag tribe. Subsequent colonists founded Salem, Boston, and many small towns around Massachusetts Bay between 1628 and 1640, at a time of increased English immigration. With a wave of immigration, and their building of towns such as Windsor, Connecticut (est. 1633), Hartford, Connecticut (est. 1636), Springfield, Massachusetts (est. 1636), Northampton, Massachusetts (est. 1654) and Providence, Rhode Island (est. 1636), the colonists progressively encroached on the traditional territories of the several Algonquian-speaking tribes in the region. Prior to King Philip's War, tensions fluctuated between tribes of Native Americans and the colonists, but relations were generally peaceful. Twenty thousand colonists settled in New England during the Great Migration. Colonial officials of the Rhode Island, Plymouth, Massachusetts Bay, Connecticut and the New Haven colonies each developed separate relations with the Wampanoag, Nipmuck, Narragansett, Mohegan, Pequot, and other tribes of New England, whose territories historically had differing boundaries. Many of the neighboring tribes had been traditional competitors and enemies. As the colonial population increased, the New Englanders expanded their settlements along the region's coastal plain and up the Connecticut River valley. By 1675 they had established a few small towns in the interior between Boston and the Connecticut River settlements. Throughout the Northeast, the Native Americans had suffered severe population losses as a result of pandemics of smallpox, spotted fever, typhoid, and measles, infectious diseases carried by European fishermen, starting in about 1618, two years before the first colony at Plymouth had been settled. Shifting alliances among the different Algonquian peoples, represented by leaders such as Massasoit, Sassacus, Uncas and Ninigret, and the colonial polities negotiated a troubled peace for several decades. For almost half a century after the colonists' arrival, Massasoit of the Wampanoag had maintained an uneasy alliance with the English to benefit from their trade goods and as a counter-weight to his tribe's traditional enemies, the Pequot, Narragansett, and the Mohegan. Massasoit had to accept colonial incursion into Wampanoag territory as well as English political interference with his tribe. Maintaining good relations with the English became increasingly difficult, as the English colonists continued pressuring the Indians to sell land. Metacomet, called "King Philip" by the English, became sachem of the Pokanoket and Grand Sachem of the Wampanoag Confederacy after the death in 1662 of his older brother, the Grand Sachem Wamsutta (called "Alexander" by the English). The latter had succeeded their father Massasoit (d. 1661) as chief. Well known to the English before his ascension as paramount chief to the Wampanoag, Metacomet distrusted the colonists. Wamsutta had been visiting the Marshfield home of Josiah Winslow, the governor of the Plymouth Colony, for peaceful negotiations, and became ill after being given a "portion of working physic" by a Doctor Fuller. The colonists had put in place laws making it illegal to do commerce with the Wampanoags. When the Plymouth colonists found out that Wamsutta had sold a parcel of land to Roger Williams, Josiah Winslow, the governor of the Plymouth Colony, had Wamsutta arrested even though Wampanoags that lived outside of colonist jurisdiction were not accountable to Plymouth Colony laws. Wamsutta's wife, Weetamoe, attempted to bring the chief back to Pokanoket. However, on the Taunton River the party saw that the end was near, and after beaching their canoes, Alexander died under an oak tree within viewing distance of Mount Hope. Metacomet began negotiating with the other Algonquian tribes against the Plymouth Colony soon after the deaths of his father Massasoit and his brother Wamsutta. His action was a reaction to the colonists' refusal to stop buying land and establishment of new settlements, combined with Wamsutta / Alexander's suspicious death. The white population of New England totaled about 80,000 people. They lived in 110 towns, of which 64 were in the Massachusetts Colony, which then included the southwestern portion of the present state of Maine. The towns had about 16,000 men of military age who were almost all part of the militia—universal training was prevalent in all colonial New England towns. Many towns had built strong garrison houses for defense, and others had stockades enclosing most of the houses. All of these were strengthened as the war progressed. Some poorly populated towns without enough men to defend them were abandoned. Each town had local militias, based on all eligible men, who had to supply their own arms. Only those who were too old, too young, disabled, or clergy were excused from military service. The militias were usually only minimally trained and initially did relatively poorly against the warring Indians until more effective training and tactics could be devised. Joint forces of militia volunteers and volunteer Indian allies were found to be the most effective. The officers were usually elected by popular vote of the militia members. The Indian allies of the colonists—the Mohegans and Praying Indians—numbered about 1,000, with about 200 warriors. By 1676, the regional Native American population had decreased to about 10,000 Indians (exact numbers are unavailable), largely because of epidemics. These included about 4,000 Narragansett of western Rhode Island and eastern Connecticut; 2,400 Nipmuck of central and western Massachusetts; and 2,400 combined in the Massachusett and Pawtucket tribes, living about Massachusetts Bay and extending northwest to Maine. The Wampanoag and Pokanoket of Plymouth and eastern Rhode Island are thought to have numbered fewer than 1,000. About one in four were considered to be warriors. By then the Indians had almost universally adopted steel knives, tomahawks, and flintlock muskets as their weapons of choice. The various tribes had no common government. They had distinct cultures and often warred among themselves. Despite different cultures they each spoke a version of the Algonquian language family. John Sassamon, a Native American Christian convert ("Praying Indian") and early Harvard graduate, translator, and adviser to Metacomet, was a figure in the outbreak of the war. He told the governor of Plymouth Colony that Metacomet was intending to gather allies for Native American attacks on widely dispersed colonial settlements. King Philip was brought before a public court to answer to the rumors, and after the court officials admitted they had no proof, they warned him that any other rumors—baseless or otherwise—would result in their confiscating Wampanoag land and guns. Not long after, Sassamon was murdered and his body was found in the ice-covered Assawompset Pond. Historians disagree on the reasons for his death, and Jill Lepore notes that most relate to his role as "cultural mediator," negotiating with both sides and no longer belonging to either. On the testimony of a Native American, the Plymouth Colony officials arrested three Wampanoag, who included one of Metacomet's counselors. A jury, among whom were six Indian elders, convicted the men of Sassamon's murder. The men were executed by hanging on June 8, 1675 (O.S. ), at Plymouth. Some Wampanoag believed that both the trial and the court's sentence infringed on Wampanoag sovereignty. In response to the trial and executions, on June 20, 1675 (O.S.) a band of Pokanoket, possibly without Metacomet's approval, attacked several isolated homesteads in the small Plymouth colony settlement of Swansea. Laying siege to the town, they destroyed it five days later and killed several people. On June 27, 1675 (O.S.) (July 7, 1675 New style date; See Old Style and New Style dates), a full eclipse of the moon occurred in the New England area. Various tribes in New England looked at it as a good omen for attacking the colonists. Officials from the Plymouth and Massachusetts Bay colonies responded quickly to the attacks on Swansea; on June 28 they sent a punitive military expedition that destroyed the Wampanoag town at Mount Hope (modern Bristol, Rhode Island). The war quickly spread, and soon involved the Podunk and Nipmuck tribes. During the summer of 1675, the Native Americans attacked at Middleborough and Dartmouth (July 8), Mendon (July 14), Brookfield (August 2), and Lancaster (August 9). In early September they attacked Deerfield, Hadley, and Northfield (possibly giving rise to the Angel of Hadley legend). The New England Confederation, comprising the Massachusetts Bay Colony, Plymouth Colony, New Haven Colony and Connecticut Colony, declared war on the Native Americans on September 9, 1675. The Colony of Rhode Island and Providence Plantations, settled mostly by Puritan dissidents, tried to remain mostly neutral, but like the Narragansett they were dragged inexorably into the conflict. 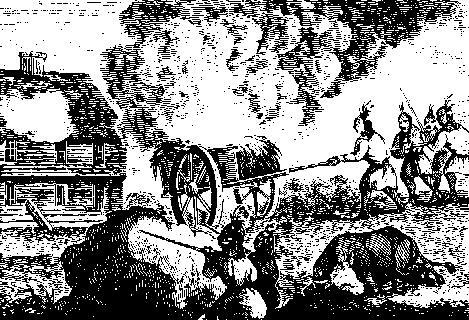 The next colonial expedition was to recover crops from abandoned fields along the Connecticut River for the coming winter and included almost 100 farmers/militia plus teamsters to drive the wagons. They were ambushed, with about 50 colonists being killed, in the Battle of Bloody Brook (near Hadley, Massachusetts) on September 18, 1675. The next attack was organized on October 5, 1675, on the Connecticut River's largest settlement at the time, Springfield, Massachusetts. During the attack, nearly all of Springfield's buildings were burned to the ground, including the town's grist mill. Most of the Springfielders who escaped unharmed took cover at the house of Miles Morgan, a resident who had constructed one of Springfield's few fortified blockhouses. An Indian servant who worked for Morgan managed to escape and later alerted the Massachusetts Bay troops under the command of Major Samuel Appleton, who broke through to Springfield and drove off the attackers. Morgan's sons were famous Indian fighters in the territory. The Indians in battle killed his son, Peletiah, in 1675. Springfielders later honored Miles Morgan with a large statue in Court Square. On November 2, Plymouth Colony governor Josiah Winslow led a combined force of colonial militia against the Narragansett tribe. The Narragansett had not been directly involved in the war, but they had sheltered many of the Wampanoag women and children. Several of their warriors were reported in several Indian raiding parties. The colonists distrusted the tribe and did not understand the various alliances. As the colonial forces went through Rhode Island, they found and burned several Indian towns which had been abandoned by the Narragansett, who had retreated to a massive fort in a frozen swamp. The cold weather in December froze the swamp so it was relatively easy to traverse. Led by an Indian guide, on a very cold December 16, 1675, the colonial force found the Narragansett fort near present-day South Kingstown, Rhode Island. A combined force of Plymouth, Massachusetts, and Connecticut militia numbering about 1,000 men, including about 150 Pequots and Mohican Indian allies, attacked the Indian fort. The fierce battle that followed is known as the Great Swamp Fight. It is believed that the militia killed about 300 Narragansett (exact figures are unavailable). The militia burned the fort (occupying over 5 acres (20,000 m2) of land) and destroyed most of the tribe's winter stores. Most of the Narragansett warriors and their families escaped into the frozen swamp. Facing a winter with little food and shelter, the entire surviving Narragansett tribe was forced out of quasi-neutrality and joined the fight. The colonists lost many of their officers in this assault: about 70 of their men were killed and nearly 150 more wounded. Lacking supplies for an extended campaign the rest of the colonial assembled forces returned to their homes. The nearby towns in Rhode Island provided care for the wounded until they could return to their homes. Throughout the winter of 1675–76, Native Americans attacked and destroyed more frontier settlements in their effort to expel the English colonists. Attacks were made at Andover, Bridgewater, Chelmsford, Groton, Lancaster, Marlborough, Medfield, Medford, Millis, Portland, Providence, Rehoboth, Scituate, Seekonk, Simsbury, Sudbury, Suffield, Warwick, Weymouth, and Wrentham, including what is modern-day Plainville. The famous account written and published by Mary Rowlandson after the war gives a colonial captive's perspective on the conflict. The spring of 1676 marked the high point for the combined tribes when, on March 12, they attacked Plymouth Plantation. Though the town withstood the assault, the natives had demonstrated their ability to penetrate deep into colonial territory. They attacked three more settlements: Longmeadow (near Springfield), Marlborough, and Simsbury were attacked two weeks later. They killed Captain Pierce and a company of Massachusetts soldiers between Pawtucket and the Blackstone's settlement. Several colonial men were allegedly tortured and buried at Nine Men's Misery in $4, as part of the Native Americans' ritual treatment of enemies. The natives burned the abandoned capital of Providence to the ground on March 29. At the same time, a small band of Native Americans infiltrated and burned part of Springfield while the militia was away. The tide of war slowly began to turn in the colonists' favor later in the spring of 1676, as it became a war of attrition; both sides were determined to eliminate the other. The Native Americans had succeeded in driving the colonists back into their larger towns, but the Indians' supplies, particularly in powder and lead, nearly always sufficient for only a season or so, were running out. The few hundred colonists of Rhode Island became an island colony for a time as their capital at Providence was sacked and burned and the colonists were driven back to Newport and Portsmouth on Aquidneck Island. The Connecticut River towns with their thousands of acres of cultivated crop land, known as the bread basket of New England, had to manage their crops by limiting their crop lands and working in large armed groups for self-protection. :20 Towns such as Springfield, Hatfield, Hadley and Northampton, Massachusetts, fortified their towns, reinforced their militias and held their ground, though attacked several times. The small towns of Northfield and Deerfield, Massachusetts, and several other small towns, were abandoned as the surviving settlers retreated to the larger towns. The towns of the Connecticut colony escaped largely unharmed in the war, although more than 100 Connecticut militia died in their support of the other colonies. The New England colonists used their own or adjacent towns' supplies and were re-supplied by sea from wherever they could buy additional supplies. The Indians had no such resources. The English government was headed then by Charles II (1630–1685), who had been restored to power as the English king (under Parliamentary oversight) after the Restoration of 1660. His father, Charles I, had been captured and executed in the English Civil War (1642–1651) by the Puritan-led Parliamentarian government of Oliver Cromwell. King Charles II had little interest in supporting the Puritans of New England and did not. The potential supporters in the Colony of Virginia were involved in Bacon's Rebellion (1676) and could not (or would not) help the New England settlers. The settlers in New York had just permanently taken the cities and territory there from the Dutch in the Third Anglo-Dutch War (1674) and were in the process of setting up an English settlement controlled by an anti-Puritan government. They offered no support for the mostly Puritan New Englanders. The New France government of this period were Catholic and rabidly anti-English, and were sponsoring on and off support for Indian tribes attacking the English settlements. The war ultimately cost the New England colonists over £100,000—a significant amount of money at a time when most families earned less than £20 per year. Self-imposed taxes were raised to cover its costs. Over 600 colonial men, women and children were killed, and twelve towns were totally destroyed with many more damaged. Despite this, the New England colonists eventually emerged victorious. The Native Americans lost many more people—mostly to disease. They died, dispersed out of New England or were put on a form of early reservations. Some of them slowly integrated into colonial society. They never recovered their former power in New England. The hope of many colonists to integrate Indian and colonial societies was largely abandoned, as the war and its excesses bred bitter resentment on both sides. The Wampanoag and Narragansett hopes for supplies of powder and lead from the French in Canada were not met, except for some small amounts of ammunition obtained from the French in Maine. The colonists allied themselves with the Mohegan and Pequot tribes in Connecticut as well as several Indian groups that had mostly converted to Christianity, the Praying Indians, in Connecticut, Massachusetts and Rhode Island. King Philip and his Indian allies found their forces continually harassed by combined groups of colonists and their Indian allies. In January 1675/76 (see Old Style and New Style dates for dating then), Philip traveled westward to Mohawk territory in what is now New York, seeking, but failing to secure, an alliance with the Iroquois. Reportedly, Philip's supporters attacked a group of Mohawks and tried to get the blame put on the colonists—Indians and colonists used virtually the same weapons then. Unfortunately for Philip, one of the attacked group survived and the Mohawks were infuriated. The New York Mohawks—an Iroquois tribe, traditional enemies of many of the warring tribes—proceeded to raid isolated groups of Native Americans in Massachusetts, scattering and killing many. Traditional Indian crop-growing areas and fishing places in Massachusetts, Rhode Island and Connecticut were continually attacked by roving New England patrols of combined Colonials and their Native American allies. When found, any Indian crops were destroyed. The Indian tribes had poor luck finding any place to grow enough food or harvest enough migrating fish for the coming winter. Many of the warring Native American tribes drifted north into Maine, New Hampshire, Vermont and Canada. Some drifted west into New York and points farther west to avoid their traditional enemies, the Iroquois. By April 1676 the Narragansett were defeated and their chief, Canonchet, was killed. 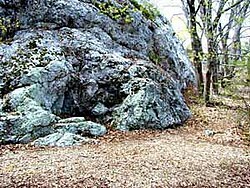 On May 18, 1676, Captain William Turner of the Massachusetts Militia and a group of about 150 militia volunteers (mostly minimally trained farmers) attacked a large fishing camp of Native Americans at Peskeopscut on the Connecticut River (now called Turners Falls, Massachusetts). 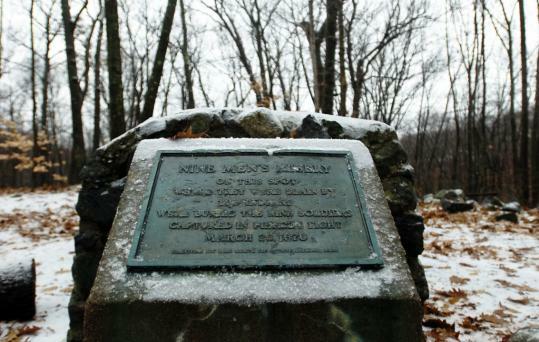 The colonists claimed they killed 100–200 Native Americans in retaliation for earlier Indian attacks against Deerfield and other colonist settlements and the colonial losses in the Battle of Bloody Brook. 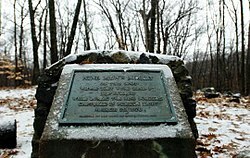 Turner and nearly 40 of the militia were killed during the return from the falls. With the help of their long-time allies the Mohegans, the colonists defeated an attack at Hadley on June 12, 1676, and scattered most of the Indian survivors into New Hampshire and points farther north. Later that month, a force of 250 Native Americans was routed near Marlborough, Massachusetts. Other forces, often a combined force of colonial volunteers and their Indian allies, continued to attack, kill, capture or disperse bands of Narragansett, Nipmuc, Wampanough, etc. as they tried to plant crops or return to their traditional locations. The colonists granted amnesty to Native Americans from the tribes who surrendered or were captured and showed they had not participated in the conflict. The captured Indian participants whom they knew had participated in attacks on the many settlements were hanged or shipped off to slavery in Bermuda. Philip's allies began to desert him. By early July, over 400 had surrendered to the colonists, and Philip took refuge in the Assowamset Swamp, below Providence, close to where the war had started. The colonists formed raiding parties of Native Americans and militia. They were allowed to keep the possessions of warring Indians and received a bounty on all captives. Philip was ultimately killed by one of these teams when he was tracked down by colony-allied Native Americans led by Captain Benjamin Church and Captain Josiah Standish of the Plymouth Colony militia at Mt. Hope, Rhode Island. Philip was shot and killed by an Indian named John Alderman on August 12, 1676. Philip was beheaded, then drawn and quartered (a traditional treatment of criminals in this era). His head was displayed in Plymouth for twenty years. The war was nearly over except for a few attacks in Maine that lasted until 1677. The war in the south largely ended with Metacomet's death. Over 600 colonists and 3,000 Native Americans had died, including several hundred native captives who were tried and executed; others were enslaved and sold in Bermuda. The majority of the fatalities for both Native Americans and the New England colonials resulted from disease, which was typical of all wars in this era. Native Americans enslaved and transported to Bermuda included Metacom's son (and, according to Bermudian tradition, his wife). Numerous Bermudians today claim ancestry from the Native American exiles. Members of the sachem's extended family were placed for safekeeping among colonists in Rhode Island and eastern Connecticut. Other survivors joined western and northern tribes and refugee communities as captives or tribal members. On occasion, some of the Indian refugees returned to southern New England. The Narragansett, Wampanoag, Podunk, Nipmuck, and several smaller bands were virtually eliminated as organized bands, while even the Mohegan were greatly weakened. Sir Edmund Andros, appointed by James II as governor of New York, negotiated a treaty with some of the northern Indian bands in Maine on April 12, 1678, as he tried to establish his New York-based royal power structure in Maine's fishing industry. Andros was arrested and sent back to England at the start of the Glorious Revolution in 1689. In this revolution, James II (1633–1701, reigning 1685-1688), a Catholic and younger brother to Charles II, and a strong believer in the Divine right of kings, was forced to flee to France in 1688 by the Protestant Parliamentarian forces. James II's appointments to the various colonial governors were replaced. King Philip's Pennacook ally early made a separate peace with the colonists as the result of battles that are sometimes identified as part of King Philip's War. Native families were granted one peck of corn annually as compensation for lost lands. They fled north. This did not necessarily spare them from the ravages of war and the tribe lost members and eventually its identity as the result of the ensuing war. For a time, King Philip's War seriously damaged the mostly second- and third-generation English colonists' prospects in New England. But with their successful governments and towns, low death rate, and their extraordinary population growth rate of about 3% a year (doubling every 25 years), they repaired all the damage, replaced their losses, rebuilt the destroyed towns, and continued to establish new towns within a few years. The colonists' successful defense of New England with their own resources brought them to the attention of the British royal government. Before King Philip's War, the colonies had been generally ignored, considered uninteresting and poor English outposts. The English authorities soon tried to exploit the colonies and their resources for the authorities' own gain—beginning with the revocation of the charter of Massachusetts Bay in 1684 (enforced 1686). At the same time, an Anglican church was established in Boston in 1686, ending the Puritan monopoly on religion in Massachusetts. The legend of Connecticut's Charter Oak stems from the belief that a cavity within the tree was used in late 1687 as a hiding place for the colony's charter as Andros tried unsuccessfully to revoke its charter and take over the militia. In 1690, Plymouth's charter was not renewed; its residents were forced to join the Massachusetts government. The equally small colony of Rhode Island, with its largely Puritan dissident settlers, maintained its charter—mainly as a counterweight and irritant to Massachusetts. The Massachusetts General Court (the main elected legislative and judicial body in Massachusetts) was brought under nominal British government control, but all members except the Royal Governor and a few of his deputies continued to be elected in the various towns, as was their practice over the prior 40 years. The "top" of the government was nominally under British government control, but the vast majority in the government continued on as before with elected local and representative legislative and judicial bodies. Only land-owning males could vote for most officials, but their suffrage was both wider and more universal than in nearly all other countries of this era. Nearly all layers of government and church life (except in Rhode Island) remained "Puritan", and only a few of the so-called "upper crust" joined the British government-sponsored Anglican church. Most New Englanders continued to live in self-governing and mostly self-sufficient towns, and attended the "Puritan" Congregational or dissident churches that they had already set up by 1690. As the population increased, new towns, complete with their own churches, militias, etc. were nearly all established by the sons and daughters of the original settlers; they were in nearly all cases modeled after the original settlements. Few people lived outside of an established town. The many trials and tribulations between the British crown and British Parliament for the next 100 years made self-government not only desirable but relatively easy to continue in New England. The squabbles that the New Englanders had with the British government would eventually lead to Lexington, Concord, and Bunker Hill by 1775, a century and four generations later. When the British were forced to evacuate Boston in 1776, only a few thousand of the more than 700,000 New Englanders of the time went with them. King Philip's War joined the Powhatan wars of 1610–14, 1622–32 and 1644–46 in Virginia, the Pequot War of 1637 in Connecticut, the Dutch-Indian war of 1643 along the Hudson River and the Iroquois Beaver Wars of 1650 in a list of ongoing uprisings and conflicts between various Native American tribes and the French, Dutch, and English colonial settlements of Canada, New York, and New England. The military defeat of the Native Americans meant that most of Massachusetts, Connecticut and Rhode Island land was nearly completely open to colonial settlement. Localized conflict continued for decades in Maine, New Hampshire and northern Massachusetts. In response to King Philip's War, which stemmed from New England expansion onto native land, the five Indian tribes in the region of Acadia created the Wabanaki Confederacy to form a political and military alliance with New France to stop the New England expansion. During the next 74 years, six colonial wars between New France and New England, along with their respective native allies, took place, starting with King William's War in 1689. (See the French and Indian Wars, Father Rale's War and Father Le Loutre's War.) The conflict was over the border between New England and Acadia, which New France defined as the Kennebec River in southern Maine. In response to King Philip's War and King William's War (1689–97), many colonists from northeastern Maine and Massachusetts temporarily relocated to larger towns in Massachusetts and New Hampshire to avoid Wabanaki Indian raids. In the fourteen months of King Philip's War in 1675-1676, Plymouth Colony lost close to eight percent of its English adult male population to Indian warfare or other causes associated with the war. Indian losses were much greater, with about 2,000 men killed or who died of injuries in the war, more than 3,000 dying of sickness or starvation, and another 1,000 Indians sold into slavery and transported to other areas, such as the Caribbean. About 2,000 Indians escaped to other tribes to the north or west; they joined continued Indian attacks from those bases well into the next century. Historians estimate that, as a result of King Philip's War, the Indian population of southern New England was reduced by about 60 to 80 percent. The war escalated from a local conflict to involve most of southern New England and reached to other east coast areas as well. The war killed nearly as high a percentage of the Indian population as the plagues of 1616-19, which had decimated the area and turned whole villages into places of death and desolation. The colonists won in King Philip's War not by greater military power, but due to their ability to outlast the Native Americans. The English suffered many military defeats and lost thousands of men, but in the end they won due to material support for the war from England. Descendants of the Mayflower Pilgrims and later emigrants called upon the might of Britain to not only help defeat the native peoples of New England, but to work to rid the land of its aboriginal people. Before the war, the native peoples of New England made up almost 30 percent of the regional population, but by 1680, five years after the war began, the native population had dropped to less than 15 percent. But, in the end, the English also lost much financially. The settlers incurred an enormous tax burden to mostly repay Britain for war assistance; it held back the economy of the entire region for many years to come. Despite the losses for Native Americans, the English colonists were unable to stop forever the threat of Indian attacks. By causing such high losses, they unbalanced relations between colonists and Indians in New England. In the past, English colonists living on the still-wild frontier of the northeast could depend on local Indian friends to help them against enemies, but after the war, the colonists had only enemies among the Indians. Well into the next century, settlers throughout the region were at risk for Indian attacks. Hundreds more colonial men, women and children were killed in such raids. Eventually the Puritan colonies found they could no longer defend themselves against continuing Indian violence, which the French particularly used in their conflicts with England. The colonists asked for military and governmental assistance from Britain. Within twenty years of King Philip's War, King James II had appointed a royal governor for the New England colonies and in 1692, Plymouth Colony became a part of Massachusetts Bay Colony. ↑ America’s Guardian Myths, op-ed by Susan Faludi, September 7, 2007. New York Times. Accessed September 6, 2007. ↑ Lepore, Jill. The Name of War: King Philip's War and the Origins of American Identity, New York: Alfred A. Knopf, 1998. Note: King Philip "was also known as Metacom, or Pometacom. King Philip may well have been a name that he adopted, as it was common for Natives to take other names. King Philip had on several occasions signed as such and has been referred to by other natives by that name." ↑ Philip Gould. "Reinventing Benjamin Church: Virtue, Citizenship and the History of King Philip's War in Early National America." Journal of the Early Republic, No. 16, Winter 1996. p. 647. ↑ Schultz, Eric B.; Michael J. Touglas (2000). King Philip's War: The History and Legacy of America's Forgotten Conflict. W.W. Norton and Co.. Note: According to a combined estimate of loss of life, based on sources from the Department of Defense, the Bureau of Census, and the work of colonial historian Francis Jennings, 600 out of the about 80,000 English colonists (1.5%) and 3,000 out of 10,000 Native Americans (30%) lost their lives due to the war. ↑ "Epidemics and Pandemics in the U.S."
↑ Exact numbers of Indian allies are unavailable but about 200 warriors are mentioned in different dispatches implying a total population of about 800-1,000. ↑ Philbrick, Nathaniel (2006 title=Mayflower: A Story of Courage, Community, and War). New York: Penguin. p. 221. ↑ Lepore, Jill (1998). The Name of War: King Philip's War and the Origins of American Identity. New York: Alfred Knopf. pp. 10. http://books.google.com/books/about/The_name_of_war.html?id=NcJ6PXii2y0C. ↑ Phelps, Noah Amherst (1845). History of Simsbury, Granby, and Canton; from 1642 To 1845. Hartford: Press of Case, Tiffany and Burnham. ↑ "Worlds rejoined". Cape Cod online. http://www.capecodonline.com/special/tribeslink/worldsrejoined13.htm. .
↑ Spady, James O'Neil. "As if in a Great Darkness: Native American Refugees of the Middle Connecticut River Valley in the Aftermath of King Phillip's War: 1677–1697," Historical Journal of Massachusetts, Vol. 23, no. 2 (Summer, 1995), 183–97. ↑ Swope, Cynthia, "Chief Opechancanough of the Powhatan Confederacy"
Eliot, John, ”Indian Dialogues”: A Study in Cultural Interaction eds. James P. Rhonda and Henry W. Bowden (Greenwood Press, 1980). ______. Relation of the Troubles Which Have Happened in New England by Reason of the Indians There, from the Year 1614 to the Year 1675 (Kessinger Publishing,  2003). ______. The History of King Philip's War by the Rev. Increase Mather, D.D. ; also, a history of the same war, by the Rev. Cotton Mather, D.D. ; to which are added an introduction and notes, by Samuel G. Drake(Boston: Samuel G. Drake, 1862). ______. "Diary", March 1675–December 1676: Together with extracts from another diary by him, 1674–1687 /With introductions and notes, by Samuel A. Green (Cambridge, MA: J. Wilson, [1675–76] 1900). Belmonte, Laura. "Edward Randolph, the Causes and Results of King Philip's War (1675)"
Cogley, Richard A. John Eliot's Mission to the Indians before King Philip's War (Cambridge, MA: Harvard University Press, 1999). Schultz, Eric B. and Michael J. Touglas, King Philip's War: The History and Legacy of America's Forgotten Conflict.' New York: W.W. Norton and Co., 2000. "Edward Randolph on the Causes of the King Philip's War (1685)", rootsweb.com.